Well, hello there! I hope you’ve had a great start to the new year and that you had a fantastic festive season. It’s summer here in Australia and we’ve just sweltered through a week-long heatwave. Thank goodness for air-conditioning. It’s not a luxury over here. It’s a health necessity. Kids have now returned to school after about 7 weeks of summer holidays. The schedule of activities is looking pretty packed. In fact, I was just about hyperventilating into a paper bag when I realised how many early starts we’re going to have this term. Sometimes I think that my head’s so cluttered with logistics and plans for keeping kids organised that I have no idea how to get through the day. But I do. And so does every other parent. Crazy times. 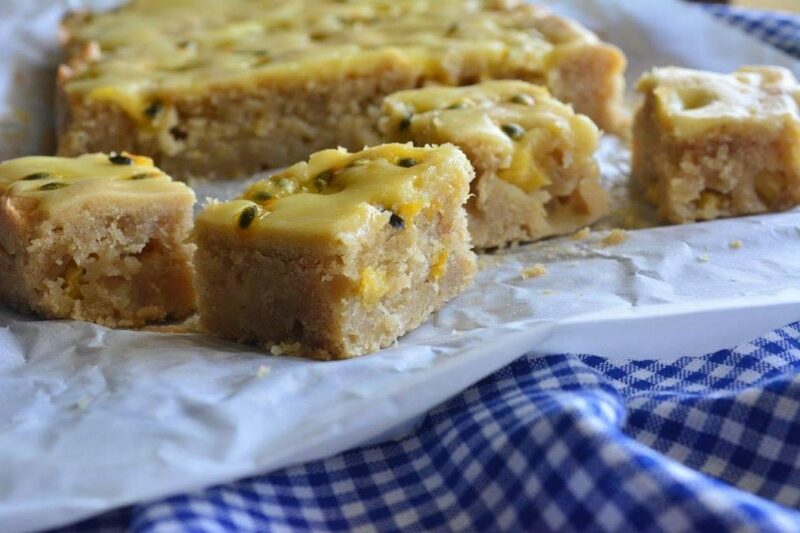 So the opportunities for me to actually develop new recipes seem to be shrinking, but this gluten-free and dairy-free tropical slice has been in the works for quite a while. I finally had some opportunity over the summer holidays to finalise it. It took a number of attempts because pineapple presents a few challenges. It’s high in liquid and will release a lot of that liquid during the cooking process. That means that it took a fair bit of tweaking to get the texture right. I was going for a “short” slice texture, but because of the liquid in the pineapple, it’s a little more cakey. I suspect that squeezing the liquid out of the pineapple might give a different result but I might save that for further experimentation down the track. It’s important to use fresh pineapple for this recipe. Canned pineapple is logged with even more liquid, so if you use it you’ll find the batter is too wet to properly cook. There’s nothing like fresh passionfruit pulp to top this one off, but if you can’t get fresh passionfruit, try to get a jar of 100 percent passionfruit pulp. Steer clear of canned pulp because the more liquid that is added to the pulp, the more the taste is diluted. And that would be a shame! 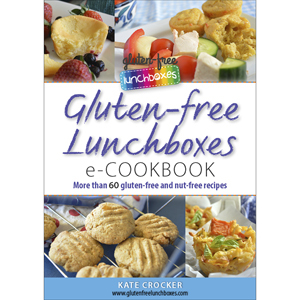 If you’re looking for other gluten-free lunchbox snacks? Check out my eCookbook. And if you’re in need of gluten-free AND dairy-free recipes, check out my post on how to convert many of the recipes in my eBook to dairy-free. Preheat oven to 180° Celsius (conventional oven) or 160° Celsius (fan-forced oven). Grease and line an 18 centimetre by 28 centimetre slice tray. In the large bowl of an electric mixer, beat egg for 5 minutes. Sift in tapioca flour, sorghum flour, brown rice flour, psyllium husk and baking powder. Add brown sugar, coconut milk powder, vanilla essence, oil and coconut milk. Mix until combined. Add pineapple chunks and gently fold into mixture. Pour mixture into slice tray and spread to evenly cover base of tray. Bake for 30 minutes. Allow to cool in tray. Meanwhile, to make the icing, sift icing mixture into a bowl. Add melted butter (or Nuttelex) and passionfruit pulp. Stir to combine. When base is completely cool, spread icing evenly over the top. Cut into 4 centimetre squares. Serve immediately, or within 3 days. Can be frozen.